"Children, please sit down at your desks!" That’s a typical teacher to student command. In most US school, you may think that school desks are part of the basics. Some progressive schools use group table sitting to foster learning and team work. However, just suppose students sit on benches versus sit at desks in school. I think that would be a different learning experience. And it would not be an unpleasant experience. 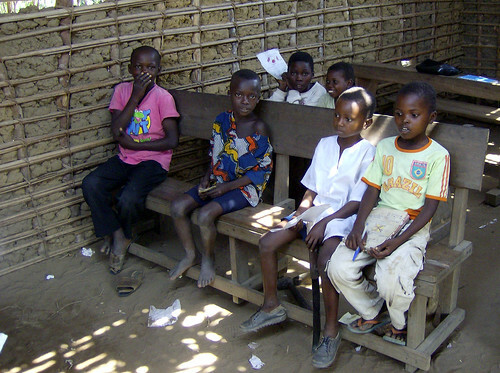 Many Congolese students do not have a school desk but they must sit on a bench. The bench is actually a church pew borrowed from the nearby church. I wonder how the teacher-student exchange starts between these Congolese students and their teacher. Since the children do not have desk, are all references to desk omitted? Are students assigned their bench positions at the beginning of the school year? Also, do they recognize their pew from church? Visit Congo Helping Hands, www.CongoHelpingHands.org/desks.htm, to support their school desk project.